Who wants to win a Walt Disney World vacation and a Disney cruise? 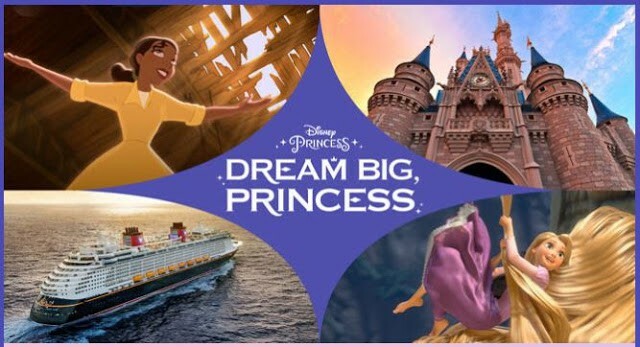 Now is your opportunity to win the vacation of a lifetime with the Dream Big Princess Sweepstakes. The Grand Prize for this fabulous Disney sweepstakes is a 3 night vacation in Walt Disney World and a 4 night Disney Cruise for a total of four guests. The vacation includes round trip coach airfare. You will stay for 3 nights at a Walt Disney World hotel and then be transfered to Port Canaveral to board the Disney Dream for a 4 night cruise. Your cruise will include a fabulous port stop at Disney’s amazing private island Castatway Cay. When you are at Walt Disney World you will have 3 day Magic Your Way Tickets so that you can visit the parks. All four guests will get a $75 Disney gift card to spend on meals when you are at Disney World. As included is a Disney Character Dining Experience, a Disney VIP Guide for 2 days, VIP viewing of a show or Disney Parade of your choice and a Memory Maker product. The Disney cruise prize includes all meals (except Palo and Remy), a chocolate in room gift, a Castle Package gift for guests aed 3 to 12, a photo package and a rainforest spa pass. You will also receive a $150 Disney gift card to spend on anything that you want. There is no purchase needed to enter. The sweepstakes closes at 11:59pm (PT) on 10/17/16. Open to persons of all ages who are legal residents of the 50 U.S., DC or Canada (excluding Quebec). Minors must get parent’s permission to enter. Limit 1 entry per person per day.